To race competitively in the North American Formula Atlantic Championship in 1982, a driver needed at least a quarter of a million dollars to pay for what it took to win: a race car, transport truck, mechanics, tires, fuel, engine rebuilds, travel, entry fees, and an endless list of expenses. If you wanted to break into the big leagues of IndyCar or Formula One racing, this was the race series in North America to prove yourself. It was just one rung down the ladder from the top, and only the best young drivers and teams competed. 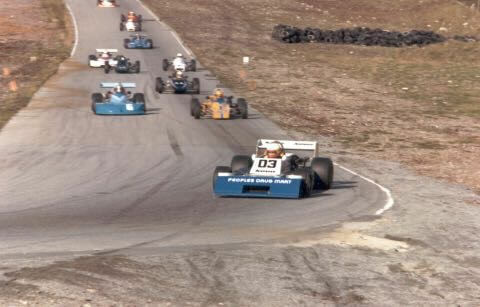 It consisted of twelve races in twelve cities throughout the US and Canada, from Long Beach, California, and Montreal, Quebec, to my hometown track just outside Vancouver (Westwood) and one of the first road racing circuits in North America—Road America in the beautiful little town of Elkhart Lake, Wisconsin. I tried everything I could to raise that money through sponsorships, and I just about did it. That is, $60,000. That’s nearly enough, isn’t it? I made the only decision that made sense to an eager twenty-six-year-old race driver: I was in. To this day, I’m not sure if I was just plain stupid, overly optimistic, maniacally stubborn, or a combination of all of them, but I was determined to race the full series, nothing less. When a young driver is at a point in his career when something’s got to happen quickly or it’s lights out, and the opportunity to make it big is slipping away, his decision-making abilities may become a little questionable. Fortunately, I had been driving for Tom Johnston, a North Vancouver-based engineer who built his own race cars. He generously agreed to provide the car, transport truck, and his expertise, and we partnered to compete in the ’82 season together. The combination of my sponsorship cash and Tom’s equipment and expertise meant we had just enough to be dangerous—and about half of what it really took to do it right. I’ve never claimed to be very smart, just driven. And very, very hopeful. To say that I was beyond excited to compete in my first full season of professional racing is a profound understatement. This was it—the big time. Time to shine. Buoyed by my sponsors’ $60,000 and Tom’s commitment, I was in! Tom owned a large, successful engineering firm, so this racing program was a part-time focus for him. But a part-time focus from Tom is like a laser focus from most people. He is one of the most brilliant people I’ve ever met. One problem. We had no crew, no team. Sure, I could drive, and Tom would fly into the races to engineer the car and manage things on race weekends (along with building and preparing the car between races), but a race team needs at least one mechanic. My younger brother Gord, who was eighteen at the time, had been helping with my racing efforts for as long as he could hold a wrench. Well, for as long as I could abuse him by having him do all the grunt work. But by then he was working a real job at the docks in Vancouver, unloading new cars as they came off ships and driving them onto trucks and trains to be delivered across the country. “Hmmph,” Gord replied. It was the usual communication between my brothers, dad, and me. I took it as a yes. While loading cars on trucks and trains didn’t exactly train someone to be a race mechanic, Gord had grown up doing much the same as me, working on cars at Dad’s shop. I knew he was qualified. The fact that he was the only person that I could convince to work like a slave for no pay helped qualify him, too. We had our one mechanic. Phew. So now I had a race team: Tom as engineer and car owner; Gord as mechanic and part-time truck driver (he and I would share driving the truck to transport the race car between events); and me as driver, travel coordinator, team manager, sponsor-hunter and supporter, part-time truck driver, and engine builder. Yes, since we couldn’t afford to have our engines built by a professional builder, that became my job, too. At the time, I had a real job working in a research lab testing fuels and lubricants. I also took a leave of absence, so racing now became my full-time occupation. Given that the $60k would also have to cover some living expenses, I knew the next six months were going to be some lean ones. I couldn’t wait. The story of the most painful season of racing for me continues next week. Click here to go directly to Part 2. A great read so far, I didnt know you were a local guy and you raced at Westwood.